Tracking reagents and other chemicals to ensure that they are withdrawn from use before their expiration dates. Tracking the location of reagents and samples to be tested. This enables these items to be rapidly located, including in containers stacked on shelves in refrigerators. Warning users if they do not put the samples or reagents in locations with appropriate temperature and humidity controls. Tracking the processing of samples through a sequence of test steps. This includes tracking samples discarded and repeated test steps. Tracking which chemicals went into producing specific reagents. This includes tracking the supplier, product and lot number. It can also include automatically recording the weight of each ingredient. 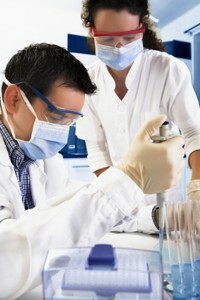 Tracking quality assurance testing and status of reagents. Printing hazardous materials labels for containers of chemicals and regents. Tracking which machines were used for specific tests. Tracking elapsed time and technician labor required for testing. Feeding tracking data to laboratory information management systems. If needed, BellHawk can be integrated with test equipment to capture test data as part of the materials traceability record. It can also be used to automatically produce certificates of analysis and certificates of compliance.